Vancouver (November 27, 2018) Solstice Sold Corp. (TSXV: SGC) (“Solstice”, the “Company”, “we” or “our”) is pleased to provide complete results from a 2018 high-resolution till program* (“Hi-Res”) covering part of the extensive 920 km2 Kahuna Gold Project (“Kahuna” or the “Project”), located near Rankin Inlet, Nunavut. 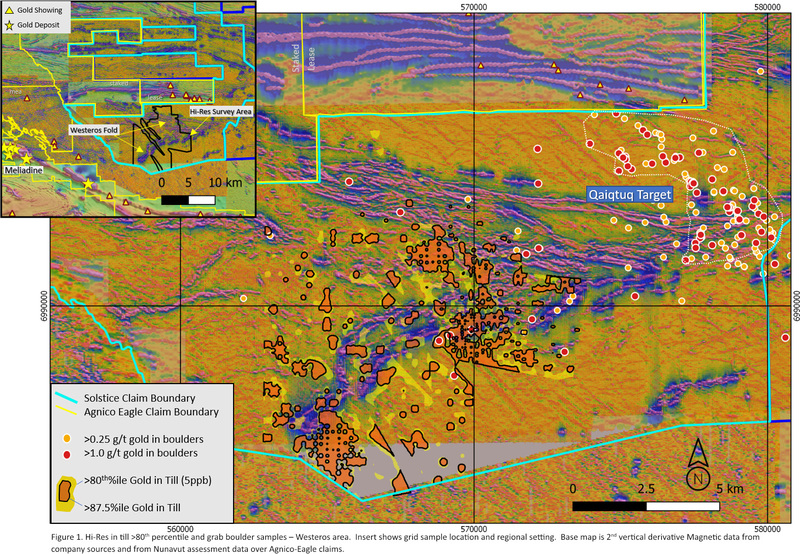 The objective of the Hi-Res till program was to test for gold potential in several priority target areas where relatively limited outcrop exists. The survey area lies southwest of the previously described Qaiqtuq target area which contains abundant elevated gold in boulders** and, locally, gold in outcrop (see news release dated November 13, 2018). Identification of three areas of elevated gold-in-till (Figure 1) referred to as SWW (Southwest Westeros), SW (South Westeros) and NW (North Westeros). The SSW area covers an area of approximately 1.3 km x 1.6 km and is immediately down-ice (southeast) of the highly magnetic southern limb of the regional Westeros fold (Figure 1). The Westeros limb in this area is interpreted to be cut by east-west trending faults which can be traced westwards towards Meliadine. The SW area covers an area approximately 2.2 km x 1.5 km and exhibits pronounced east west trends which are parallel to interpreted faults in the area. 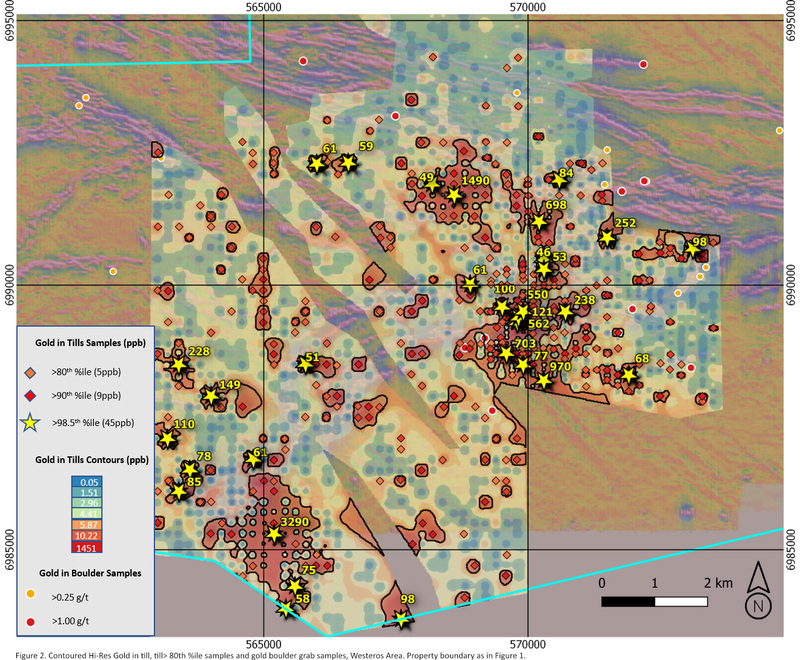 Elevated gold-in-till in the SW area also correlates with anomalous grab samples of mineralized boulders and locally mapped iron formation (Figure 1). The NW area covers an area of approximately 1.1 km x 1.0 km and is close to highly magnetic trends associated with the northern limb of the Westeros fold. This area is associated with a major splay fault system off the regional Raptor-Westeros fault zone and thus represents an attractive target for follow up. A total of 32 till samples contain >98.5th %ile gold values of between 45ppb and 3290ppb gold (Figure 2). These elevated values occur in each of the three target areas described above as well as in other areas. It should be noted that the till samples reported herein are not concentrates and that nominal 1 Kg samples would be expected to contain substantial amounts of extraneous and dilutive material. The >98.5th %ile gold-in till gold contents described herein, which would be considered high even in rocks from this area, and should be viewed in this context. It is possible that elevated gold-in till between the NW and SW targets (Figure 2) ‘bridges’ the two areas possibly conforming to the outline of an interpreted fold nose in this area. “On November 13, we summarized positive results from our detailed boulder and outcrop sampling programs in the Qaiqtuq area which represents an eight-kilometre-long target now set up for drilling. Our focussed exploration strategy has confirmed new targets in prospective parts of the Westeros fold. It is worth bearing in mind that this fold has an impressive 40 km unfolded strike length. Taken together with our recently announced regional sampling programs, we believe that we have demonstrated gold prospectivity over a large part of our extensive property position in what we consider to be the emerging Meliadine gold district.” Stated David Adamson, Executive Chairman. Approximately 1 kg of till is collected from frost boils every 100 metres along grid lines spaced approximately 200 metres apart. The samples are dried and shipped in secure sample bags using unique security coded tags to ALS Canada Ltd in North Vancouver B.C. an accredited analytical laboratory. At the lab the samples are dried, weighed, pulverized and screened to -600 mesh. Gold and trace element analysis are determined by ICP-MS after Aqua regia digestion using a 50g sample. Rock samples are collected in plastic bags in the field and are shipped in secure sample bags using unique security coded tags to Activation Laboratories Ltd. in Thunder Bay Ontario, an accredited mineral analysis laboratory. All samples are analyzed for gold using a standard 50g fire assay technique, samples returning over 3.0 g/t Au are analyzed using 50g fire assay-gravimetric method. For both till and rock samples, the company routinely inserts standard and blank reference materials as part of Solstice Gold’s quality control/quality assurance program (QAQC). QAQC results from samples presented in this news release did not reveal any issues with the disclosed results. **Assay results from grab samples (boulders) are selected samples and are not necessarily representative of the mineralization hosted on the property. Grab sample weights range from 0.75kg to 3kg. This news release contains information with respect to adjacent or similar mineral properties, including Meliadine, in respect of which the Company has no interest or rights to explore or mine. Readers are cautioned that the Company has no interest in or right to acquire any interest in any such properties, and that mineral deposits on adjacent or similar properties are not indicative of mineral deposits on the Company’s properties. Past performance is no guarantee of future performance and all investors are urged to consult their investment professionals before making an investment decision. Investors are further cautioned that past performance is no guarantee of future performance.